This has turned out to be a long blog entry with lots of photos! These are probably my favourite posts to write. I love fountain pens! I’ve been buying pens since schools days and it’s an obsession that’s got worse since then. Having made the decision to start using more of my fountain pens, and getting a couple of my old pens repaired, I’ve now settled on a set of pens and inks that I carry with me every day and use on some sort of rotation. It’s proven remarkably difficult to reach a state of stability given how many interesting pen addict websites there are and the distractions and temptations from Twitter. 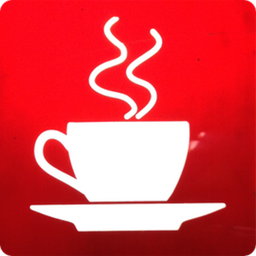 I’m looking at people like @HelgeG, @bsag and @m_s here! Let’s have a quick word from Graham Greene at this point. My two fingers on a typewriter have never connected with my brain. My hand on a pen does. A fountain pen, of course. Ball-point pens are only good for filling out forms on a plane. 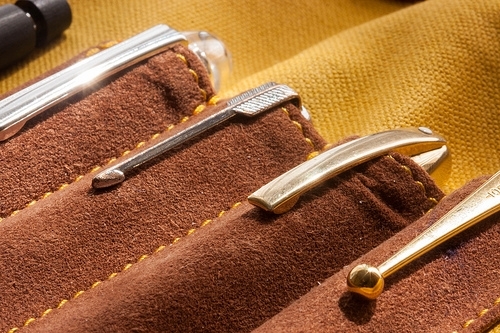 I carry five fountain pens in my Enveloop case; a couple of vintage pens and some modern Japanese pens. I particularly enjoy using the vintage pens because they have smooth and narrow nibs — modern nibs seem to be generally a little wider than vintage nibs. One of these old pens is my father’s Parker ’51 and I find it particularlyy satisfying that this pen is still in the family and getting daily use after 60 years. This has been my daily ‘go to’ pen for the last few years because there is nothing quite as practical as a capless pen. 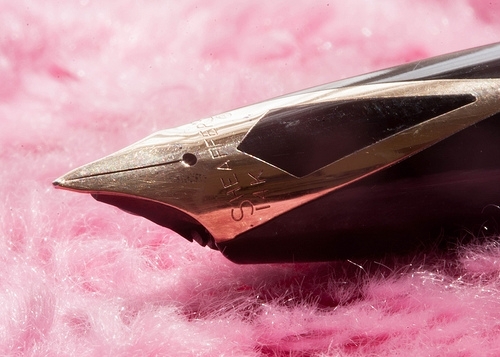 The nib is a medium and is as smooth as silk. As a pen it puts down a line that’s slightly too broad for me but Pilot’s fine nibs are just too fine for my handwriting. This pen is always filled with Noodler’s Eternal Bullet-Proof black ink for a really dense black. I love the design of the Fermo pen because it avoids the need for a button which always looks just a little strange on their other capless pens. 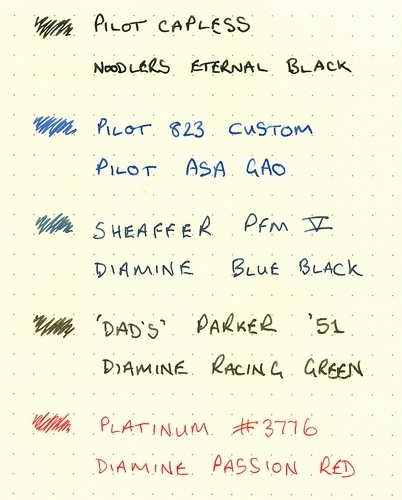 This is a fairly new acquisition that I bought when I read about the TWSBi Vac 700 pen. The vacuum filling mechanism means that this pen has a huge capacity for ink (if fully loaded) and that big nib is beautifully smooth. This is a great pen for daily use with one minor inconvenience that the ink shut-off valve needs to be opened by unscrewing the back of the pen slightly before use. 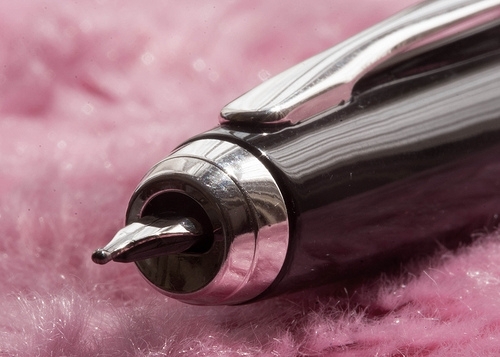 This is not just a pen, this is a ‘Pen For Men’ — like a Yorkie bar it’s not for girls. According to the [advertisements at the time(http://www.flickr.com/photos/craiglea/6988395159/in/photostream) it has “bold styling with balance and heft, a solid feel and man-sized grip” ! I love the styling of this 1950s pen, and the design of the inlaid nib gives the pen a sleek appearance despite the fact that it’s a big pen. 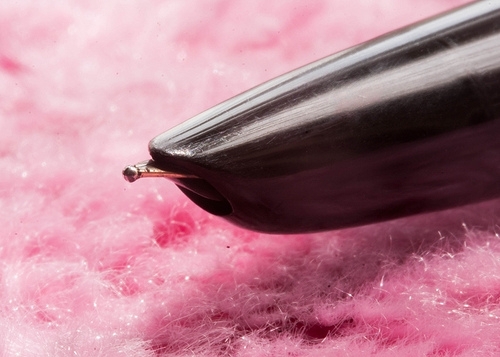 The PFM has a ‘snorkel’ filling mechanism that means there is no need to immerse the pen nib into the ink when filling. It’s a very convenient mechanism to use but this never really worked as well as I thought it should. Since the pen was serviced by Eric Wilson this pen feels a lot more effective now. There’s a pattern here… I like pens with hooded nibs — I would love to have kept space in my pen case for my Lamy 2000 fountain pen which is another classic pen design and great favourite. This was my father’s pen from the 1950s and it’s a practical pen for day-to-day use. This is a pen with a huge ink capacity and very modern appearance despite its vintage. I’ve filled this pen with Diamine Racing Green ink and this classic colour suits the pen well. 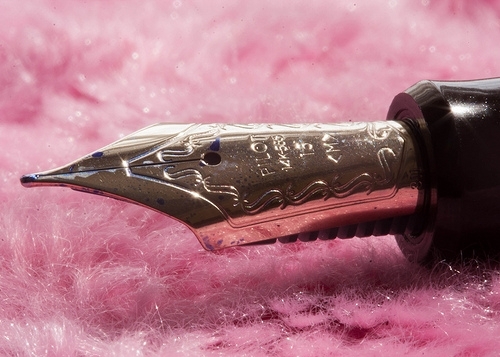 If I had to choose a pen to use when marooned on a desert island it would be a Nakaya fountain pen. In the real world the closest I can get is a Platinum #3776 pen. 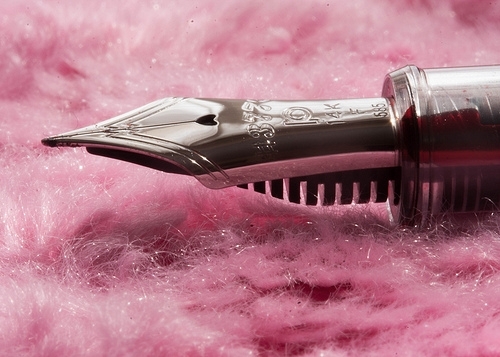 This one is a demonstrator with a fine nib and loaded with Daimine’s Passion Red ink. This is my ‘obsessively correcting documents with spidery red text pen’! The ink gives each pen its personality.